The cobbled classics are back underway and with the likes of Fabian Cancellara and Tom Boonen coming towards the end of their careers, the focus naturally turns towards youth. This season we are spoiled for choice with young cobbled talents making their breakthrough. AG2R have Alexis Gougeard, while at LottoNL-Jumbo there’s Tom Van Asbroeck and Mike Teunissen. Meanwhile Etixx-QuickStep can look to Yves Lampaert in the coming years. 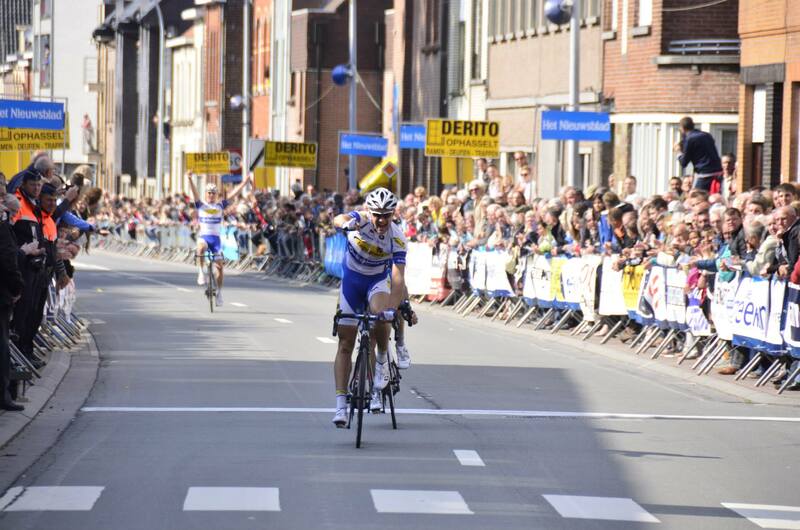 We saw two others at Wednesday’s Dwars door Vlaanderen. In the front group there was 23 year-old Edward Theuns, sprinting to second place behind his Topsport Vlaanderen teammate Jelle Wallays to cap a memorable day for the Belgian squad. Just under a minute and a half later came 21 year-old Tiesj Benoot of Lotto-Soudal, winning the sprint for sixth place after leading the chase on behalf of his teammate Jens Debusschere for the best part of 40km. The two men from Gent will be riding the Ronde van Vlaanderen next week, with Benoot riding today’s E3 Harelbeke and Theuns joint-leader at Sunday’s Gent-Wevelgem. Here’s a look at what Theuns has done in the past, and what is possible for the future. A piece about Benoot will follow later. Theuns started out at local club Koninklijke Gent Velosport, combining cycling with playing football for KFC Merelbeke. 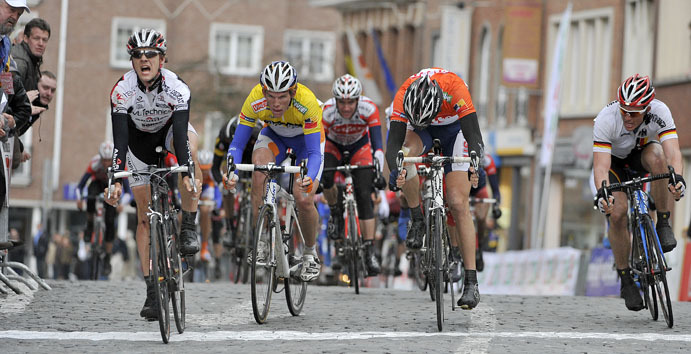 After some strong results he moved to junior team KSV Deerlijk-Gaverzicht for 2009. The most notable alumni of the team is the legendary Briek Schotte, winner of two World Championships, two Paris-Roubaix and two editions of the Ronde van Vlaanderen. Others that have passed through the ranks include Marcel Kint, Johan Bruyneel, Patrick Lefevere, Nico Eeckhout and current Etixx-QuickStep rider Julien Vermote. Back to Theuns and he won his first race (the junior version of the Beverbeek Classic), taking seven other wins before changing team in 2010. The destination was VL Technics Abutriek, which would be his home for the next four seasons. 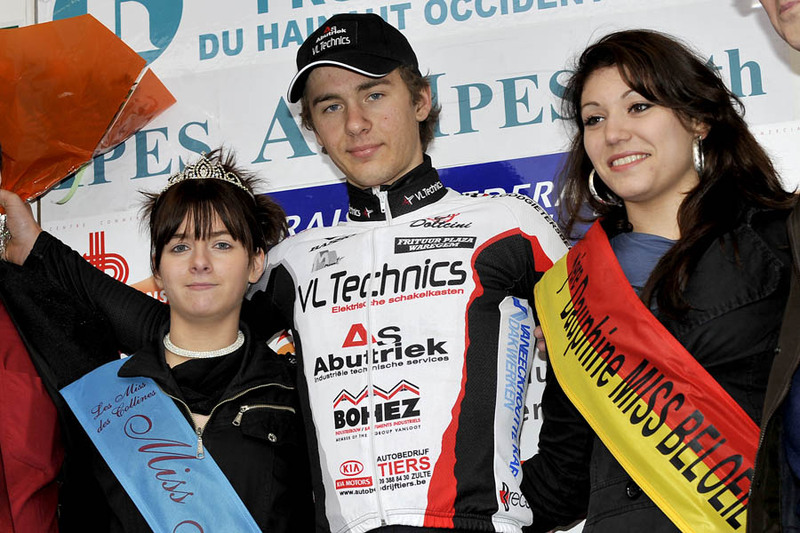 Combining racing with university studies, Theuns was successful straight away, winning a bunch sprint in the Triptyque des Monts et Châteaux stage race. Among the men he beat were now-familiar names like John Degenkolb, Taylor Phinney and Jetse Bol, all of whom were riding for much bigger development squads. His second season was tougher, the only win coming in a smaller race at the end of the season. 2012 saw him participate in the Ronde van Vlaanderen espoirs for the first time as well as becoming the time trial champion of East Flanders. Later in the year he finished in the top ten of Paris-Tours espoirs. The final year before turning professional was his best yet with consistent performances throughout the year. 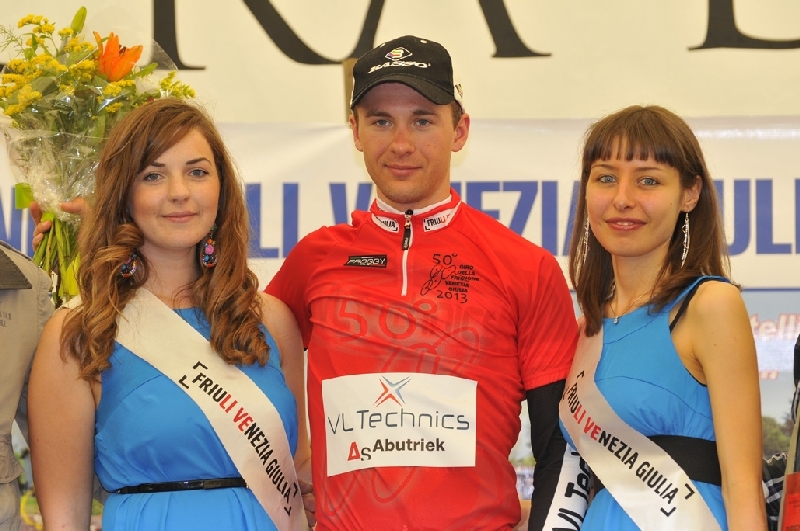 Spring saw him win the time trial at Triptyque des Monts et Châteaux before finishing sixth at Liège – Bastogne – Liège espoirs and then taking the mountains jersey at the prestigious stage race the Giro della Regione Friuli-Venezia Giulia. A podium spot in the Belgian U23 TT Championships followed, before finshing eighth at the road race. His reputation as a strong time trialist was further enhanced by a win in the prologue of the Ronde van de Provincie Ost-Vlaanderen. Theuns rounded out his time as an amateur with a call-up to Belgium’s Worlds team and another eighth place Paris-Tours espoirs. ProContinental team Topsport Vlaanderen came calling, and last year Theuns turned professional. He had a solid start at his new team, taking 21st at Omloop Het Nieuwsblad, sprinting to third in the Handzame Classic and finishing Paris-Roubaix. August was the best month of his first year as a professional though – he outsprinted Marcel Kittel to take third on stage two at the Arctic Race of Norway. Days later his first professional win came at the GP Stad Zottegem, as his team played the finale to perfection for Theuns to win a two-man sprint against Wanty’s Tim De Troyer. 2015 has seen him step up a gear, and three months into the season Theuns leads the UCI Europe Tour by 89 points. He started the season in France, taking seventh at the hilly GP la Marseilaise before consistent riding at the Etoile de Bessèges saw him take the points jersey fter four top ten finishes. Fifth in the sprint at the Clásica de Almería followed, and then a tough time in the mountains at the Vuelta a Andalucía (along with two top ten finishes) set him up for the start of the Belgian season. Finishing 14th at both Omloop Het Nieuwsblad and Kuurne-Brussel-Kuurne were decent results, especially given how tough the former was. It wouldn’t be much longer until better results came though, winning the sprint from a five man lead group at the Ronde van Drenthe after riding on the front for most of the final kilometre. The next day he was fourth at the Dwars door Drenthe, before taking fifth place at the weather-affected Ronde van Zeeland Seaports – a race which saw just twenty riders finish. We all know what came next, but we don’t yet know what is to come. Sunday sees the chance to measure himself against some of the best sprinters in the world as Kristoff, Sagan, Cavendish, Degenkolb and Greipel fight it out at Gent-Wevelgem. Beyond that, the big challenges of the Ronde van Vlaanderen and Paris-Roubaix..
Theuns has come to wider prominence on the cobbles, and that looks to be where his future targets lie. Theuns is a great all-rounder though – he is a strong sprinter, can time trial well and can get over hills too. In terms of style, Greg Van Avermaet seems a good comparison to make. As is usually the case with talented Topsport Vlaanderen riders, a move to the WorldTour beckons. We have seen Kris Boeckmans, Sep Vanmarcke, Yves Lampaert and Tom Van Asbroeck all make the move in recent year, and with Theuns’ contract up at the end of the year it looks like he will follow. You can follow Edward on Twitter here, and view his palmares here.